Artemisia annua, also known as sweet wormwood, sweet annie, sweet sagewort, annual mugwort or annual wormwood (Chinese: 黄花蒿; pinyin: huánghuāhāo), is a common type of wormwood native to temperate Asia, but naturalized in many countries including scattered parts of North America. ↑ The Plant List Artemisia annua L.
↑ English Names for Korean Native Plants (PDF). Pocheon: Korea National Arboretum. 2015. p. 359. ISBN 978-89-97450-98-5. Archived from the original (PDF) on 25 May 2017. Retrieved 25 January 2016 – via Korea Forest Service. ↑ "BSBI List 2007". Botanical Society of Britain and Ireland. Archived from the original (xls) on 2015-01-25. Retrieved 2014-10-17. ↑ Flora of China Vol. 19, 20 and 21 Page 523 Sweet Annie, sweet sagewort, armoise annuelle Artemisia annua Linnaeus, Sp. Pl. 2: 847. 1753. 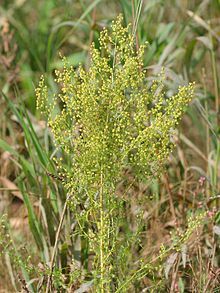 ↑ Altervista Flora Italiana, Assenzio annuale Artemisia annua L.
This page was last changed on 5 November 2017, at 06:13.